I have another indie polish for you today. I'm discovering more and more indie polish brands I'm interested in. 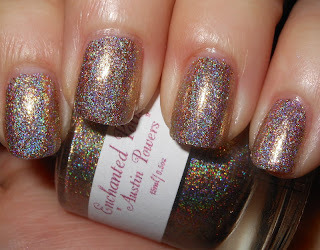 I was very excited to see Enchanted Polish made holos! I picked this one up a few weeks ago. I got to admit I was partially intrigued by its name. Come on now...Austin Powers?!? Groovy baby! Austin Powers is a golden-bronze scattered holo with small coppery/bronze flecks. This is truly holo-rific! I do not have any gold-bronze holographic polishes, so this nicely took up that empty space in my holo polish collection. This polish is also very unique, if you enlarge the photo you see the bronze-coppery flecks that give dimension. Austin Powers is a great name for it. It definitely brings to mind Austin Powers, and gets that little tune in my head from those films. I paid $12 for this one. Enchanted Polish can be found on etsy. She currently does not have stock in her shop, but she's good at restocking. You can find updates on her shop on her Facebook page. Ahahaha!! Great name! XD Lovely! whoa! That one is awesome! You may just break me and my "no indie polish" stance I've been taking (I seriously have put stuff in my cart on Etsy when a shop opens, only to have it sell out from the time I click to go to the checkout :( ) So i've been kinda grumpy towards indies! hahaha I'm such a baby. This is beautiful though! Oh my gosh, I LOVE this!!! It's soooo beautiful!! DO want!